Are you being left out of the internet revolution? Is broadband not available in your area, or is it too expensive to install? Perhaps you are in a rural area and unhappy with the speed and quality of your connection. The latest Tooway technology offers you a solution. Using the latest, most powerful satellites in their class, we can offer a range of packages at competitive prices. With up to 20 Mbps download speeds for everyone and full coverage in even the remotest areas this is the ideal technology for anyone outside a major city. Do not wait for cable infrastructure to reach your premises, or for the telephone lines to be upgraded. Average installation takes only 90 minutes. We install the satellite dish, modem and get you connected. No internet? Or too slow? No location is too remote. Get added value with VoIP, VPN and HD TV delivered all through the same receiver. Get onto the web, make video and telephone calls over the internet and even enjoy HD TV. Professional installation is required; however, once up and running you will have a whole new world of broadband internet at your command. 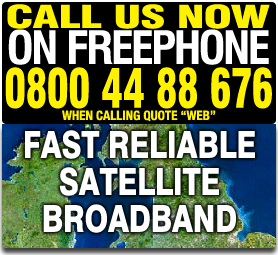 Call us on Freephone 0800 4488676 to book a consultation and site survey, and get your satellite broadband. Next generation KaSat technology delivered by satellites specifically designed to deliver fast broadband. Get in touch now to get connected.